An Post is accused of a "policy" of moving main street post offices into shopping centres, "destroying the heart of towns". Campaigners from Thurles, Co Tipperary, are attempting to keep their town's post office open on Liberty Square. An Post says that it has no such "policy", but acknowledged: "We are looking to move to places where people do their shopping." The Thurles premises is set to be relocated to a nearby shopping centre. 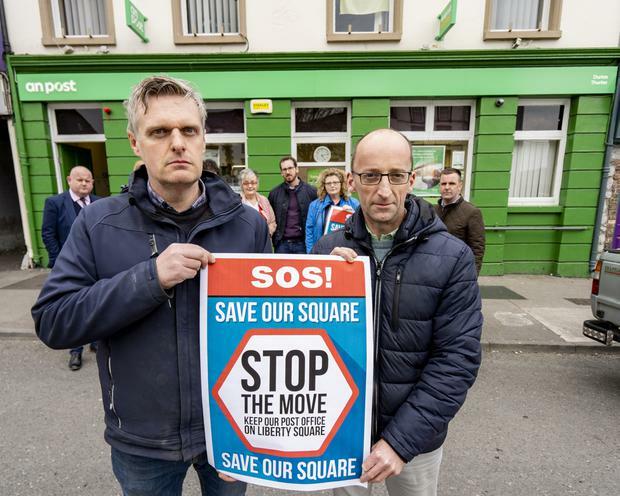 The 'Stop the Move, Save Our Square' campaign group has held protests and a series of meetings. Chairman of the campaign Councillor Jim Ryan said: "Our post office has been in Liberty Square in Thurles for 160 years. We have an older community. OAPs, people with disabilities here rely on being able to get to the post office, where it is in the square. It would be nearly a kilometre for an older person to walk from the current post office location." He said the group raised its concerns to the CEO of An Post, David McRedmond, and warned him it could "destroy the heart of every town centre" if replicated nationwide. A spokesman for An Post denied Mr McRedmond had said there was a national policy to relocate post offices into shopping centres. The spokesman added: "He (Mr McRedmond) was explaining the reason why we are moving in Thurles. We have a premises on Liberty Square, it's an old building. "We need to develop and the cost is prohibitive but we have a chance to move a short distance away where we can open the best modern post office in the country outside of Dublin. "The policy has always been to have the post office where the footfall is, and often that's the main street or in a shopping centre..."